WATERLOO - A free public event at Wilfrid Laurier University's Waterloo campus on Thursday, April 5 will put Indigenous rights and reconciliation in the spotlight. The two-part event will feature an evening keynote address from MP Romeo Saganash and an international legal panel, while an afternoon panel will focus on the principle of free, prior and informed consent when policies or land use decisions affect Indigenous peoples. "The events will engage the Laurier and broader Kitchener-Waterloo community in important questions about what it means for Canada to implement the United Nations Declaration on the Rights of Indigenous Peoples (UNDRIP)," said Alex Latta, chair of Laurier's Department of Global Studies. The evening event begins with a keynote address by Saganash, who will speak about his private member's bill, now endorsed by the Liberal government, to bring UNDRIP into Canadian law. His talk is titled "Bill C262, Canadian Law and the United Nations Declaration on the Rights of Indigenous Peoples." 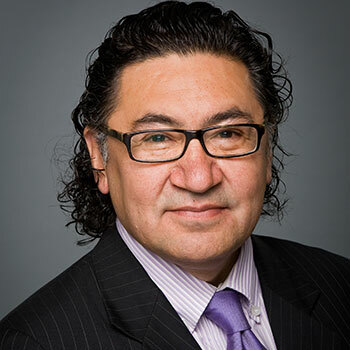 "Harmonizing UNDRIP and Canadian law will support Indigenous self-determination while advancing the potential of productive, mutually beneficial business partnerships," said Terry Mitchell, community psychology professor and director of Laurier's Indigenous Rights and Resource Governance Research Group and co-director of the Pan-American Indigenous Rights and Resource Governance Network (PAIRR-GN). Following the keynote will be an international panel of Indigenous rights experts, who will provide further reflections on UNDRIP and its implications for consultation and consent in resource governance. Dalee Sambo Dorough, associate professor at the University of Alaska and past chair of the United Nations Permanent Forum on Indigenous Issues, a specialist in Indigenous human rights standards, political and legal relations between nation-states and Indigenous peoples, and the status and human rights of Alaska Natives. José Aylwin, a Chilean human rights lawyer and adjunct professor of law at the Universidad Austral de Chile. A specialist in Indigenous peoples' and citizens' rights in Latin America, he is legal advisor for the International Work Group on Indigenous Affairs (IWGIA) and director of Observatorio Ciudadano (Citizens' Watch), a human rights NGO. Paul Joffe, a Canadian Indigenous rights lawyer who has been involved for many decades in international standard-setting processes related to the United Nations Declaration on the Rights of Indigenous Peoples, the draft American Declaration on the Rights of Indigenous Peoples, and the Indigenous and Tribal Peoples Convention, 1989. "The panel will turn significant attention to Canada's extraterritorial responsibilities in relation to the Declaration," said Latta. "This is incredibly relevant given the federal government's recent announcement of a new ombudsperson to hear and investigate complaints against Canadian enterprises operating abroad. Canada is the largest source of mining investment in the world, and many Canadian companies operating overseas, in places like Chile, have come under fire for human rights violations and environmental damage." The event, titled "Indigenous Peoples, Canada and the Declaration," will take place from 7-9 p.m. at the Balsillie School of International Affairs, 67 Erb Street W., Waterloo. Darren Thomas will moderate the panel. Register at Eventbrite. The afternoon event features a panel of scholars, practitioners and graduate students. Two panellists will introduce UNDRIP and the principle of free, prior and informed consent. Two other panellists will highlight current research by Laurier faculty and graduate students in partnership with Matawa First Nations, whose traditional lands sit upon a valuable deposit of chromite and other minerals in Northern Ontario, called the Ring of Fire. Peggy Smith, professor emerita at the Faculty of Natural Resources Management, Lakehead University. Jennifer Preston, Indigenous rights coordinator for the Canadian Friends Service Committee. Darren Thomas, Indigenous Studies instructor, Wilfrid Laurier University. Courtney Arseneau, Community Psychology doctoral candidate, Wilfrid Laurier University. The panel, titled "Free, Prior and Informed Consent: Implications for Reconciliation with Indigenous Communities Today," will take place from 3-4:30 p.m. in room 214 at the Laurier Centre for Community Research Learning and Action, 232 King St. N., Waterloo. Register at Eventbrite.